This article is about a province in the Netherlands. For the article about the province of Limburg in Belgium, see Limburg (Belgium). For the article about the town of Limbourg or Limburg in Belgium, see Limbourg. For other uses of the name "Limburg", see Limburg (disambiguation). 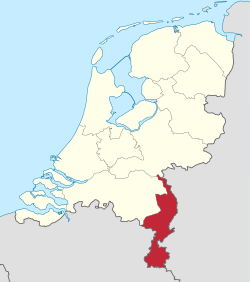 listen), Dutch and Limburgish: (Nederlands-)Limburg) is the southernmost of the twelve provinces of the Netherlands. It is located in the southeastern part of the country and is bordered by the Dutch provinces of Gelderland to the north and North Brabant to the north and northwest, Germany (state of Northrhine-Westphalia) to the east and Belgium (the Dutch-speaking province of Limburg and French-speaking province of Liège) to the south and part of the west. Its capital is Maastricht. Limburg has a highly distinct character. The social and economic trends which affected the province in recent decades generated a process of change and renewal which has enabled Limburg to transform its national peripheral location into a highly globalized regional nexus, linking the Netherlands to the Ruhr metro area and the southern part of the Benelux region. A less appreciated consequence of this international gateway location is rising international crime, often drugs-related, especially in the southernmost part of the province. Limburg's name derives from the fortified castle town known as Limbourg, situated on the river Vesdre near the High Fens, currently in the Belgian province of Liège. It was the seat of the medieval Duchy of Limburg which extended into the Meuse region north of the city of Liège. However, most the area of the current Dutch Limburg was not part of this polity but was divided among several states including the Duchy of Brabant, the Duchy of Jülich, the Duchy of Guelders, and the Bishopric of Liège, as well as the Duchy of Limburg. A result of this division is still evident in the plethora of distinct varieties of the Limburgish language spoken in Limburg municipalities. For centuries, the strategic location of the current province made it a much-coveted region among Europe's major powers. Romans, Habsburg Spaniards, Prussians, Habsburg Austrians and French have all ruled Limburg. he first inhabitants for whom traces have been found were Neanderthals that camped in South Limburg. In Neolithic times flint was mined in underground mines; including one at Rijckholt that is available to visit. In Roman times Limburg was thoroughly Romanized and many existing towns and cities like Mosa Trajectum (Maastricht) and Coriovallum (Heerlen) were founded. Bishop Servatius introduced Christianity in Roman Maastricht, where he died in 384. After the Romans had the Franks took charge. The area flourished under Frankish rule. Charlemagne had his palace in nearby Aachen. After the partition of the Frankish empire the current Limburg belonged, like the rest of the Netherlands, to the Holy Roman Empire. The territory of Limburg was from the early Middle Ages usually divided between the Duchy of Brabant, Duchy of Gelderland, Duchy of Jülich, the Principality of Liège and the prince-bishop of Cologne. These dukes and bishops were nominal subordinates of the Emperor of the Roman Empire, but in practice they acted as independent sovereigns who were often at war amongst themselves. Their conflicts were often fought in the Limburg area, contributing to the fragmentation of the area. The New time Limburg was largely divided between Spain (and its successor, Austria), Prussia, the Republic of the Seven United Netherlands, the Principality of Liège and many independent small Fiefs. In 1673, Louis XIV personally commanded the siege of Maastricht by French troops. During the siege, one of his brigadiers, Charles de Batz-Castelmore d'Artagnan, perished. He subsequently became known as a major character in The Three Musketeers by Alexandre Dumas, père (1802–1870). Limburg was also the scene of many a bloody battle during the Eighty Years' War (1568–1648), in which the Dutch Republic threw off Habsburg Spanish rule. At the Battle of Mookerheyde (14 April 1574), two brothers of Prince William of Orange-Nassau and thousands of "Dutch" mercenaries lost their lives. Most Limburgians fought on the Spanish side, being Catholics and hating the Calvinist Hollanders. Following the Napoleonic Era, the great powers (England, Prussia, the Austrian Empire, the Russian Empire and France) united the region with the new Kingdom of the Netherlands in 1815. A new province was formed which was to receive the name "Maastricht" after its capital. The first king, William I, who did not want the name Limburg to be lost, insisted that the name be changed to "Province of Limburg". As such, the name of the new province derived from the old Duchy of Limburg that had existed until 1648 within the triangle of Maastricht, Liège, and Aachen. When the Catholic and French-speaking Belgians split away from the mainly Calvinist northern Netherlands in the Belgian Revolution of 1830, the Province of Limburg was at first almost entirely under Belgian rule. However, by the 1839 Treaty of London, the province was divided in two, with the eastern part going to the Netherlands and the western part to Belgium, a division that remains today. With the Treaty of London, what is now the Belgian Province of Luxembourg was handed over to Belgium and removed from the German Confederation. To appease Prussia, which had also lost access to the Meuse after the Congress of Vienna, the Dutch province of Limburg (but not the cities of Maastricht and Venlo because without them the population of Limburg equalled the population of the Province of Luxembourg, 150,000 ), was joined to the German Confederation between September 5, 1839 and August 23, 1866 as Duchy of Limburg. On 11 May 1867, the Duchy, which from 1839 on had been de jure a separate polity in personal union with the Kingdom of the Netherlands, was re-incorporated into the latter with the Treaty of London. The style "Duchy of Limburg" however continued in some official use until February 1907. Another idiosyncrasy survives today: the head of the province, referred to as the "Queen's Commissioner" in other provinces, is addressed as "Governor" in Limburg. In 't Bronsgroen Eikenhout is the official anthem of both Belgian and Dutch Limburg. Limburg has its own language, called Limburgish (Dutch: Limburgs). This has been an official regional language since 1997, and as such it receives moderate protection under Chapter 2 of the European Charter for Regional or Minority Languages. It is not recognised by the Dutch, German and Belgian governments as an official language. Limburgish is spoken by an estimated 1.6 million people in both Belgian and Dutch Limburg and Germany. There are many different dialects in the Limburgish language. Almost every town and village has its own slightly different dialect. Dialects in the southeast (near Aachen) are closer to Ripuarian, and are sometimes classified as Southeast Limburgish, while dialects spoken in the Meuse (Dutch: Maas) valley have a somewhat lighter tone to them. Even within the cities of Venlo and Maastricht, very different dialects separated by major isoglosses continue to exist. These distinctions have been around for hundreds if not thousands of years. The provincial council (Provinciale Staten) has 63 seats, and is headed by a Queen's Commissioner that is uniquely among Dutch provinces called the Governor. While the provincial council is elected by the inhabitants, the Governor is appointed by the Queen and the cabinet of the Netherlands. The former Governor was Leon Frissen. The populist PVV is currently the largest party in the council. The daily affairs of the province are taken care of by the Gedeputeerde Staten, which are also headed by the Governor; its members (gedeputeerden) can be compared with ministers. The south of the province is remarkable when compared to the rest of the country, as it is one of the few regions that has hills. The highest point in the Netherlands, the Vaalserberg, is situated at the Dutch-Belgian-German border. The most important river is the Meuse, that passes through the entire length of the province from South to North. Limburg's surface is largely formed by deposits from this Meuse river, consisting of river clay, fertile loessial soil and large deposits of pebblestone, currently being quarried for the construction industry. In northern parts of the province, further away from the river bed, the soil primarily consists of sand and peat. Major cities are the provincial capital Maastricht and the urban agglomerations of Sittard-Geleen and Parkstad Limburg (including Heerlen) in the south and Venlo in the north. Limburg makes up one region of the International Organization for Standardization world region code system, having the code ISO 3166-2:NL-LI. In the past peat and coal were mined in Limburg. In the period 1965–1975 the coal mines were finally closed. As a result in the two coal mining areas, Heerlen-Kerkrade-Brunssum and Sittard-Geleen, 60,000 people lost their jobs. A difficult period of economic re-adjustment started. The Dutch government partly eased the pain by moving several government offices (including Stichting Pensioenfonds ABP and CBS Statistics Netherlands) to Heerlen. The state-owned corporation that once mined in Limburg, DSM, is now a major chemical company, still operating in Limburg. Other industries include a car factory (in Born), Océ copiers and printers manufacturers in Venlo and a paper factory in Maastricht. There are four beer breweries. Traditionally the southern part of Limburg has been one of the two main fruit growing areas of the country. Over the last some four decades however large fruit growing areas have been replaced by water, as a result of gravel quarrying near the river Meuse. Tourism is an essential sector of the economy especially in the hilly southern part of the province. The town of Valkenburg is the main centre. Since about 2005, when the two provincial newspapers "De Limburger" and "Limburgs Dagblad" merged, the one left is carrying both names. Since 1970 yearly on the Pentecost weekend an international popmusic festival called "Pinkpop Festival" takes place in the southern part of Limburg; initially at Geleen, since 1988 at Schaesberg. Fouryearly the World Music Contest, a competition for professional, amateur and military bands, (sometimes called 'the Olympic Games of brass band music') is held in Kerkrade. Also in Kerkrade (situated on the German border) since 1973 in principle yearly the "Schlagerfestival" is held, a nationally broadcasted event, presenting performs of singers in the German-language pop music category called "Schlagers". As in many places there's a church chorus, choral singing is a notable kind of music in this province. One of the best known of these choruses is the "Mastreechter Staar" (Maastricht star), that also is performing nationally and internationally in purely secular contexts. Many places in both Netherlands' and Belgian Limburg still have their own (by now folkloristic) citizen force. Yearly there's a festival, in which all 160 of them compete for the highest honours to be gained, in the "OLS" (Oud Limburgs Schuttersfeest), which is held in either a place in Belgian Limburg or in Netherlands' Limburg. In Limburg there are currently four professional soccer clubs, of which two, Roda JC Kerkrade and VVV-Venlo, compete in the Eredivisie, the highest national division. MVV Maastricht and Fortuna Sittard play in the Eerste Divisie, the second highest division. In 2012, for the sixth time, the UCI Road World Championships will be held in the hilly southern part of the province. The area also plays background to the Amstel Gold Race classic. Jo Coenen - Architect and urban planner. Thijs Wilms (1943 Helden- Panningen) - Co-author comic strip "Ox Tales"
This year from april 5 till oktober 7 in Venlo the ten yearly world horticulture expo "Floriade" is being held. This page uses content from the English language Wikipedia. The original content was at Limburg (Netherlands). The list of authors can be seen in the page history. As with this Familypedia wiki, the content of Wikipedia is available under the Creative Commons License.